Detailed Description: Schneider Electric/Square D Homeline™ 2-Pole Quad tandem circuit breaker features thermal magnetic molded case for extra protection. Circuit breaker has current rating of 15 Amps on outside pole and 40 Amps on inside/common trip pole. It has voltage rating of 120/240 VAC and interrupt rating of 10 kilo-Amps. It accommodates aluminum wire of range 12 - 6 AWG and copper wire of range 14 - 6 AWG. 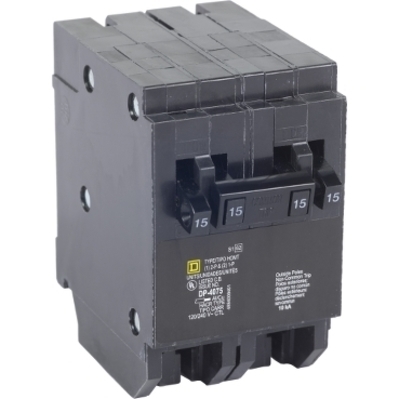 The 1-Phase circuit breaker measures 2 Inch x 2.980 Inch x 3.130 Inch and provides long-time instantaneous trip functions to perform efficiently. It offers overload and short circuit protection for added safety. Circuit breaker uses plug-on mounting to hold firmly. It is ideal for load center applications. Circuit breaker meets UL/CSA standards.